It has been a few weeks since E-GameShow ended. For those of you who haven’t been following us (which you should! We are on twitter @TeamFromBeyond, or you can just use the RSS feeds if you’re older fashioned) we have attended a game convention between June 2nd and 5th. It goes without saying that we were as excited as the dog seeing snow for the first time. We presented 2 games: Paralycid and NeonTown. Neon Town is the game that Tansel has been the developer of. It’s a top-down action game by TreneonGames. Paralycid is our very own thriller/adventure game. 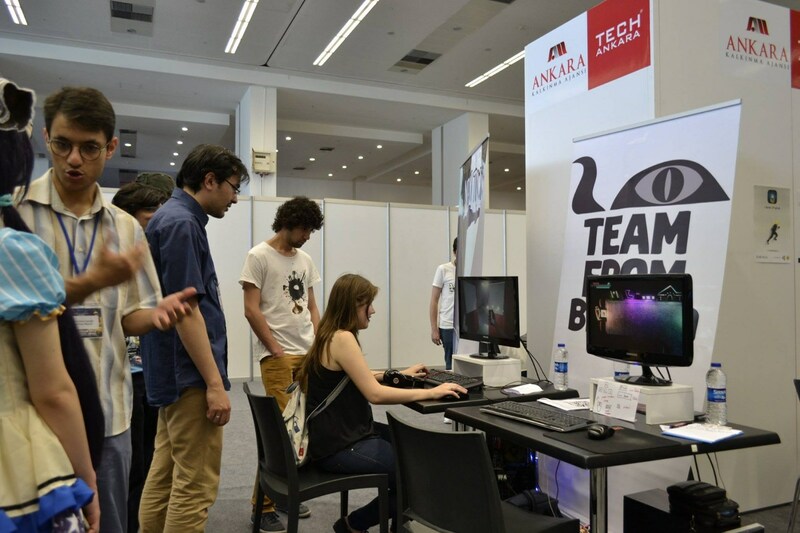 E-GameShow is in Ankara and isn’t the biggest gaming con in the world. 30K people attended this year, and last year (its first year) they say it was only half as big as it was this year. The main attraction points of the convention were the tournament stage (2) where they broadcasted League of Legends matches the entire 4 days, the main stage (1) where the talks were given and the cosplay contests were held. More established game studios had their own booths. Us mere indie studios were stuck in the indie developers area (the grey rectangle) (10+ teams in an area of 60 square meters). We had 5 square meters, and since we went the earliest we got to choose wherever we wanted. The indie developers’ area was further away from the crowd, and we managed to place our booth somewhere (the red cross) so it faced the incoming traffic. Also make sure to check these gems out from the convention! Paralycid wasn’t in that well of a shape when we attended the con. 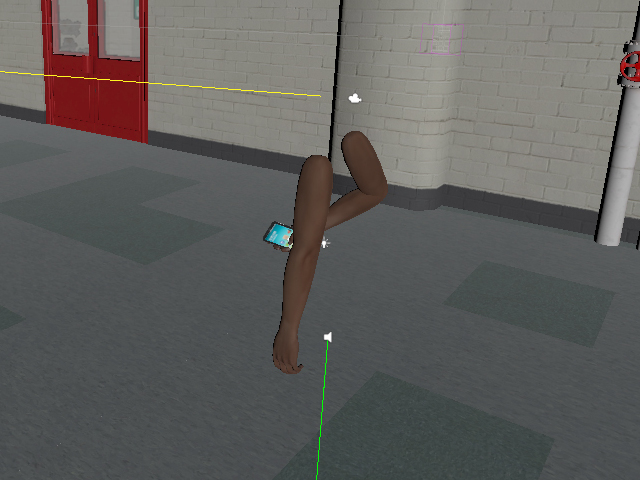 We were just re-doing the levels; all of the school props were getting re-modelled. The game story, as good as it was, wasn’t suitable for a convention. We needed a something packed, something that gave the player the most in the smallest amount of time. 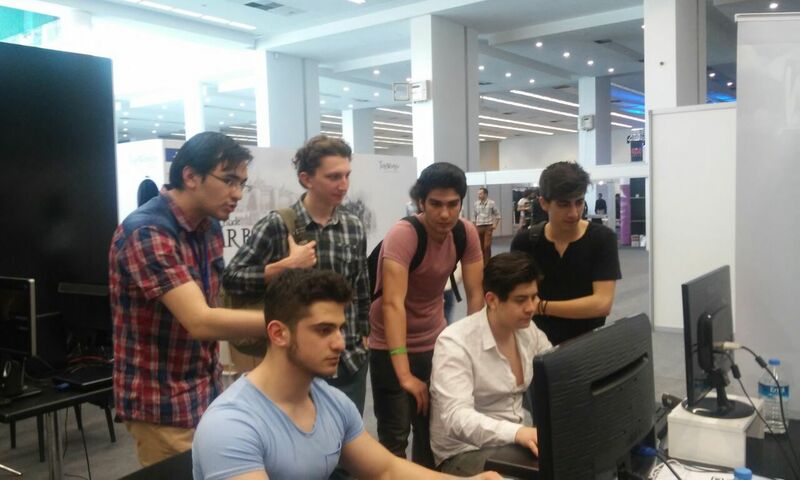 The walking simulation that we had in the first two days later turned into a demo with a story and puzzles: Although not the ideal one, we were able to give the visitors a gameplay experience. We prepared a demo that featured the core game mechanics: phone interactions, a very basic puzzle… It wasn’t easy to immerse the player into the story within the sort of setup we had, so we would guide them through the story: Who Carla is, what sleep paralysis and lucid dreaming is… Then we let them figure out the rest, only intervening whenever they needed a hint we forgot to put in the story. 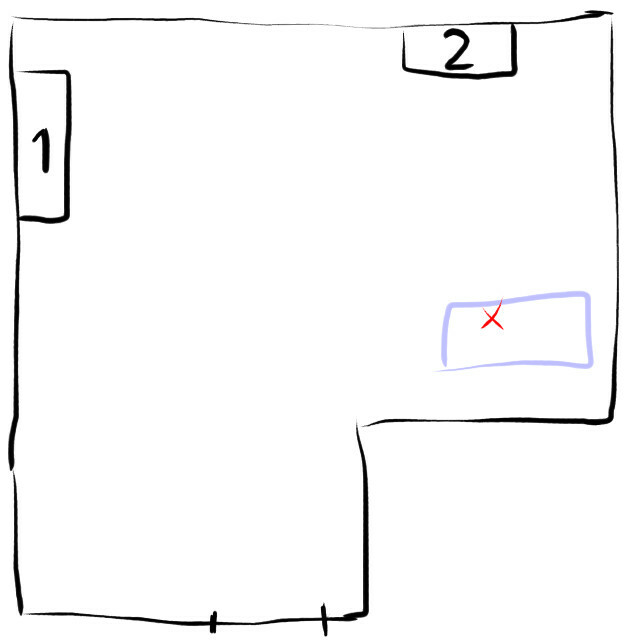 The player needed 3 hands: WASD to move Carla, mouse to look around and cursor keys to use the phone. Players had to take their right hand (assuming they are right handed) off the mouse and put it on the cursor keys. The new input scheme we have designed only uses WASD and the mouse to control both the Carla and the phone. We’re also bringing the phone closer so it’s also easier to see. Dialogue scenes got people bored. The intro had Carla and Julia texting back and forth for a while. One of the fantastic feedbacks we had was that we make the chat interactive: let the player decide what to say! This is going make the conversation scenes exponentially more engaging. When we ask the player to perform a task, we need to give them the right feedback about whether they did it right or wrong and even more is telling them what they did wrong. Otherwise it just makes for a frustrating gaming experience. TeamFromBeyond has never been idle, we are all working very actively, but not necessarily on Paralycid :) We’re now making progress on Paralycid faster than ever. Keep your eyes open on our twitter feed as we keep you posted with goodies and teasers. Next convention we’re going to attend is GameX, in December 2016. With E-GameShow 2016, we as a team lost our convention virginity. It wasn’t glorious or epic, we did a decent job; but we also have a lot more ideas now about how to make a better impression the next time. When a player has put the headphones on, trying to absorb all that we are trying to give, people lining up behind him and bumping into him take away from his gaming experience. In our next convention booth, we’re going to have a gloomy little cave for the players to crawl into. No more back-seat-gaming, no more photographers elbowing our visitors. This may be a new term for the younger gamers. In the arcade gaming machines, if the machine was left idle it would play teasers and gameplay footage until someone inserted a coin and started the game. Not everyone that comes to our booth likes to play the game; some just like to watch. Not only that, a gameplay video is appealing to visitors, they can stand for a few seconds and watch the gameplay video and decide whether they like it or not. We have experienced this a lot with NeonTown, if somebody was playing the game, a random person passing by was more likely to check it out than if the game was just at the main menu. Often if the chair was empty, we would play the game so there was some gameplay on the screen to look at (and the game is quite fun). The problem is, when somebody is already playing the game, the visitor cannot immediately play the game. Games presented in conventions should have "attract mode"s, and our games definitely will. Out of however many people that played our games in the convention plus those that we passed our cards and fliers to, only a minority of them ended up following us online. A visitor is going to be handed out hundreds of fliers the same day. Ideally we plan to give them the better experience and stand out that way, but still there must be better ways of staying connected. We’ll have some fancier things up our sleeves the next time.